Have you ever sat down to meditate, or maybe just tried to clear your mind only to have some barely audible voice in the back of your head throw off your concentration? Maybe some tiny cynic quietly prods you when you’re trying to sleep, or reminds you of some dreadful reality at the most random of moments. If you’re familiar with this disruptive voice then you’ll know what I’m talking about. These ghosts of the unconscious haunt us in a way the English language falls short of describing. There is no word in English for this phenomenon. And when we have no word for things we tend to deny their existence. This puts as at odds when what’s happening in our minds. Oh, how many times I have questioned whether or not that little voice in the back of my mind is really just a warning sign of pervading dementia. Fortunately, the German language has a word for this enigmatic phenomena. The word is hintergedanke and it means a nagging unconscious thought, especially one that upsets the equilibrium of a dominant perspective. It is the monkey that throws the wrench into the existential paradigm, so to speak. Ironically, this word can also mean “having a hidden agenda” which semantically opens up a fantastic conversation about unconscious motivation. In other words, there are thoughts in our minds that do not arise consciously or intentionally, but are instead arrive in our minds from below the surface of our understanding. This division can lead to serious inner turmoil. We feel helplessly torn between the “lower,” irrational self and the “higher,” rational self. 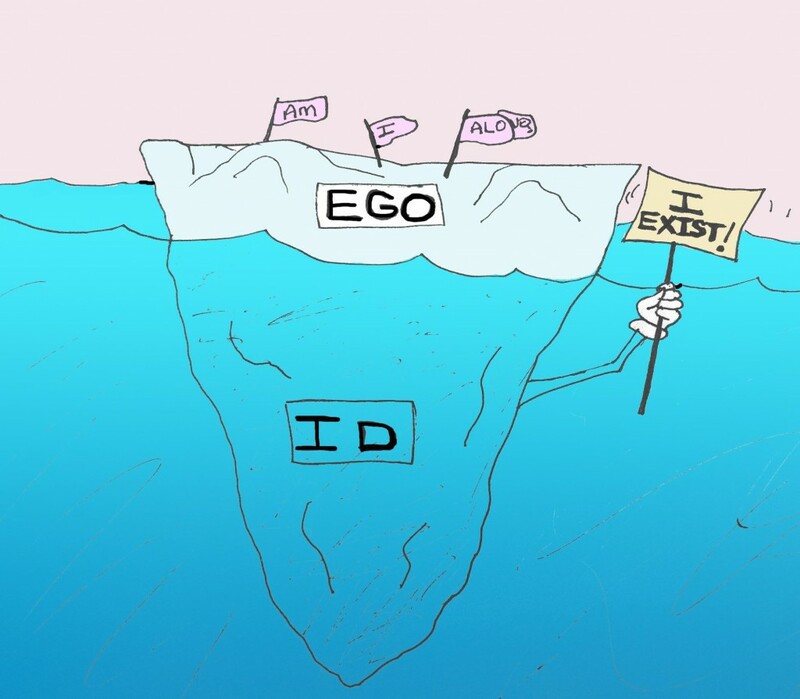 The passionate versus the responsible, the id versus the ego. And yet there is only one Self. This conflict inside ourselves is a manifestation of our attempt to translate feelings into words. The translation leads to misunderstandings. Why not reverse this process? Imagine trying to feel a thought. That is, try to experience a thought without thinking about it. There is no need to rationalize everything that happens, no need to think about everything all the time as if we couldn’t get along otherwise. Thinking is all to often an attempt to control, to get a handle on something. The more we try to control ourselves and take the reins of the world around us, the more we realize we are helplessly losing control. We do not have to think to breath or for our hearts to pump or for our nerves to feel. These things happen as naturally as the sun gives life to the trees. So when a hintergedanke creeps your mind, close your eyes and I feel it. It is a part of you and it wants to be known. And then, let it go.